Supreme Court Justice Ruth Bader Ginsburg did not attend the State of the Union on Feb. 5 despite reportedly attending a concert the night before President Donald Trump’s address to the nation. 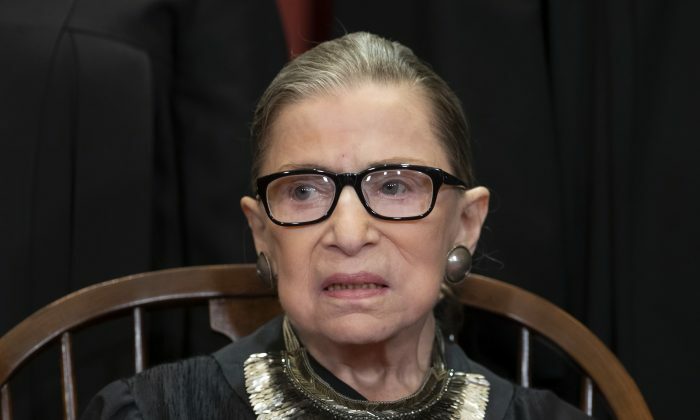 Ginsburg, 85, spent over a month out of the public eye after having to undergo surgery to remove cancer that was found when doctors took X-rays of the oldest Supreme Court justice after she fell in her office in November 2018 and broke three ribs. The concert took place at the National Museum of Women in the Arts. No photographs or video footage emerged of Ginsburg at the event. According to the Associated Press, the National Constitution Center, which sponsored the concert, didn’t permit photography. Jeffrey Rosen, president and CEO of the center, took to Twitter to say that Ginsburg attended the event. “Thrilled that Justice Ginsburg attended the first concert performance of #NotoriousRBG in Song. She, Patrice Michaels, and the performance were magnificent!” he wrote. A Supreme Court spokesperson confirmed to CNN that Ginsburg attended the event. Ginsburg did not speak at the concert and “many in the crowd did not know she was there,” according to the openly liberal Washington Post. Her daughter-in-law did not announce Ginsburg’s presence. The Supreme Court justice sat in the back and some people saw her only as they left the performance, the Post claimed. The writer, Robert Barnes, took to Twitter to indicate that he had personally seen Ginsburg at the concert. The information about Ginsburg and fellow Supreme Court Justices Clarence Thomas, Stephen Breyer, Sonia Sotomayor, and Samuel Alito was correct, as none ended up showing. Justices Brett Kavanaugh, Neil Gorsuch, John Roberts, and Elena Kagan attended the speech. Reporters on the scene shared pictures of the four justices arriving about 30 minutes before the speech started. Ginsburg has never attended a State of the Union given by a Republican president. She missed all of the addresses given by former Republican President George W. Bush while attending every single one of former Democratic President Barack Obama’s speeches. She attended some of the State of the Union speeches given by former Democratic President Bill Clinton, who nominated her to the court. Ginsburg broke from the supposed nonpartisan ranks of the Supreme Court prior to Trump’s election, claiming that Trump was “a faker” who “really has an ego,” saying that she hoped he wasn’t elected. She later apologized. Ginsburg’s reported sighting at the concert helped tamp down speculation that her health is in jeopardy after the surgery since she missed oral arguments for the first time after being appointed to the court in 1993 and hadn’t been spotted in weeks. Speculation crescendoed on Jan. 21 as Fox News ran a graphic indicating that Ginsburg had died but later said that it had appeared due to a technical error. Still, some suggested that without pictures of Ginsburg at the concert, it wasn’t clear if she was there. “RBG has been sighted but no photographic evidence. Is this in preparation for her missing the State of the Union?” wrote Sebastian Gorka, a radio host and former assistant to Trump, on Twitter. RBG has been sighted but no photographic evidence. Is this in preparation for her missing the State of the Union? We’ll discuss the #SOTU & more on America First! Guests include: @DuckCommanderPR, @ericmetaxas & @thechrisbuskirk. “Does it count as a public appearance if the public doesn’t see it?” added political commentator Michael Knowles. James Ginsburg, Michael’s husband and Ginsburg’s son, said prior to the event that his mother has been recovering, walking one mile a day and working with her trainer again. Ginsburg has undergone a number of medical procedures in recent years. In 2014, she underwent a heart procedure to have a stent placed in her right coronary artery. She also broke two ribs in a fall in 2012 and has survived two other bouts of cancer. A Supreme Court spokeswoman said in the last official update for Ginsburg that her recovery was “on track” and that she would eventually return to the court.